So are we finally seeing the end of 2-dropStone? Cool art, but a filler sadly. Elemental krocolisk?, i'll take it, for now is just a filler, but, who know which elemental synergys we'll uncover this next 2 years. I love elemental decks, and I am glad Blizz have made a sincere effort to keep them around now that Un'Goro is taking most of them away. 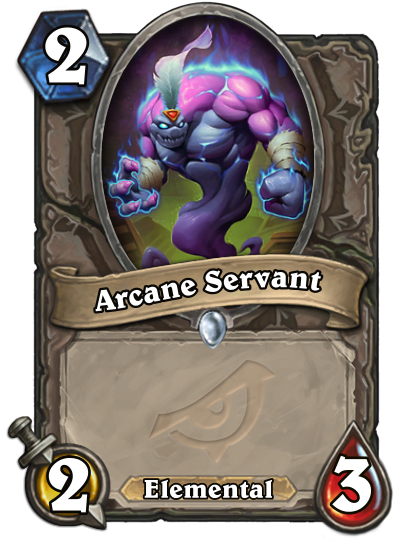 Solid neutral cards like this are key to keeping them relevant into the future. For when you absolutely, positively have to play an Elemental on turn 2. Oh, wait, that's never, after rotation. One expansion late I guess. whats the value here? elemental synergy is barely a thing going forward. Vanilla elemental. I guess this will have it's purpose interacting with other cards.